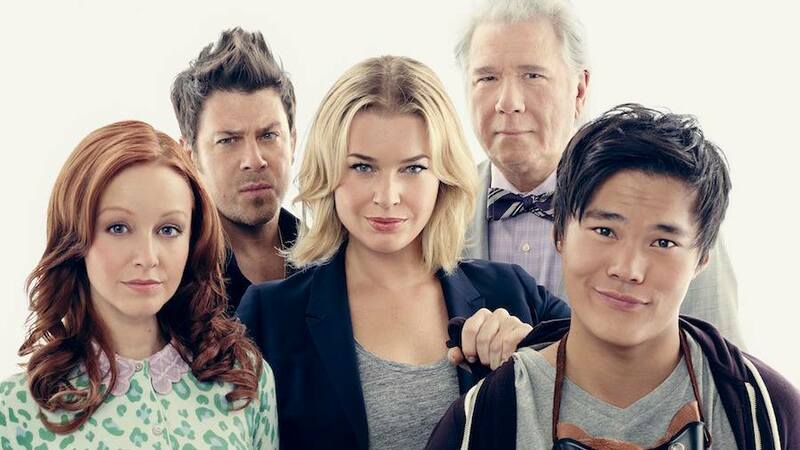 The Librarians is entering its second season this autumn on TNT starting November 1st. 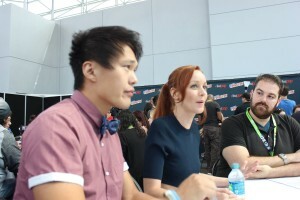 Having seen all three TV movies and season one, I’m definitely looking forward to more Librarians! The Geekiary was invited to sit with the cast at NYCC for a roundtable discussion. Q: How’s the Con going so far? 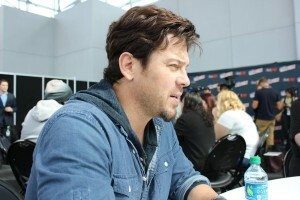 John: It’s different from last year because last year the show hadn’t come out yet when we did the Con. This year they understand the references and they get the jokes. Lindy: They know who we are. John: It’s a lot better that way. Q: Coming into season 2, anything you can tell about your character’s development? Lindy: Yeah. Part of the whole season 2 is that it’s kind of like the second year of college. We get to know more about who these people are and how they’ve grown. And at the end of last season we all went off on our own […] We’re sort of doing our own thing now […] We are Librarians. And at the beginning of this season there’s kind of this giant storm that sort of hovers over New York City. And it’s a storm so big that no one Librarian can possibly figure this out on their own. So, we have to come back together sort of team-up. It’s going to be the whole team and it is sort of fun watching us try, with our sort of new found knowledge, to try to get back together and try to work as a team. John: I think as far as skills go […] They are no longer cynical to the idea of magic. It is no longer absurd to them so with that in mind now it’s about advancing further and further into this world of magic and science and actually seeing what will actually come of it and how we deal with these situations and problems. The fact that we have graduated essentially into full-grown Librarians is also another factor I guess and we get to play elements of it. We all think we kind of know what’s best and we all have different approaches and that’s the fun of it. We bring all these elements together and get to see that mix and match. Q: So, what was your favorite moment for your character last season? John: I think for Ezekiel, probably at the end of 1×06, the Science Fair episode, he, I did a nice little act for Cassandra here and it was the first time I think we really, I mean beyond the little moment in the cage with the Minotaur, see a sensitive side to Ezekiel. So, that was fun to play something different. Lindy: The first season I had so much fun with so much of it but I think for me the Christmas episode […] I’m Christmas crazy. Like I’m almost that level excited about Christmas. Lindy: I love Christmas. So, when they wrote the scene they were like Cassandra is really into Christmas and I was like ‘Oh! I’m gonna go big’ because I would freak out if I met Santa Claus in real life. I mean if someone was just like ‘Hey, this is real’ and I’ll be like […] and they’re like are you sure you want to go that big with that? And I was like ‘Yes! It’s Santa Claus’ […] So that was definitely my favorite. John: Yeah, Lindy shows up excited to work every day, but those seven days we were filming the Santa Claus episode she just showed up with just an extra centimeter of that smile. Lindy: Yeah, they were like what do you want to wear and I was like I want to wear an Elf costume. Q: The show for me is that you have all these challenges and then you have these small intimate moments as a team. Do we have more of that? Lindy: Yeah! Especially since we’ve gone off on our own at the end of last season […] And each of us deals with magic in a different way. I think part of the greatness of the show is that it will always kind of be like that because we are so different. We do have specific specialties and it’s even deeper now because they are friends. They are working together and they do know each other. So, I think the connections and the relationship development has grown more this year. And I think that’s the most fun part for us to play because sometimes it’s not even on the page and it’s just one of those things we get to explore and you share a look or share a laugh or do something behind someone’s back and no one else sees it. Those are the fun parts for us. John: As an actor, it’s a lot of fun because when you play a character how you would approach…you know Cassandra would be totally different to how I would approach Jacob Stone or Jenkins […] I like the fact that each character has their own different relationship with another […] And ultimately at the end of the day it’s like a family like you have your relationships with your older sisters or your younger brothers, your mum, and it’s totally different […] To be able to play each scene custom to that is a lot of fun. It’s not doing the same thing over and over, which is a joy, because each and every day is exciting. Q: Do you guys have a favorite intimate moment from last season? Was there one in particular […] Even when watched you were like yeah this is magic? Lindy: That one in the Science Fair was totally super sweet. I had one in the Pilot episode with Noah, probably my favorite and I […] It was scripted but it wasn’t blocked like the way it was scripted. I was on the other side of the room […] And it said Cassandra gives him a hug and I realized I was on the other side of the room and I had to like […] I just ran and sort of like jumped into his arms and he sort of got knocked off his feet a little bit and Dean came up to me and was like ‘Why did you do that? I was all choked up,’ and I was like it said to do it and I did it. But he was like and the running? And I was like I don’t know […] There was sweetness to it and I think I got Noah off guard too, which is hard to do because he’s so […] But I don’t think he was expecting a running girl so that was it. Lindy: This season I get to do a lot of Larroquette work. John: I complained about it. Lindy: It’s an honor of my life. John: Thanks guys we got to move on! Q: What can you tell us about Season two? John: You know, more of the same, but better in a way, because I was telling the other table […] You know in the first season so much of the conflict in the show was about the personalities of all these people who have come together […] Jenkins would be happy if they all went away. But by the end of season one we’ve overcome the conflicts that might exist between any group of people who have to work, and so those hurdles don’t have to jumped anymore. In season two we come together as a team as a family […] So the adventures and the dilemmas they have to try and solve to save the world from magic being in the wrong hands become more of thrust as opposed to who are you and why the hell are you here kind of story. Q: So, what was your favorite moment from Season one? John: I think at the end […] Jenkins has to have a sword fight and actually fights his father as we find out, a young version of his father and Jerry O’Connell got to be that part, Rebecca’s husband, and I loved doing that. I love sword fighting. Second time I sword fought. The first time was on stage as young actor in a play but I was fun. Q: You got channel your inner Errol Flynn. John: Oh yeah! Deeply buried […] My inner Walsh Berry. Q: You mentioned that when you were doing plays when you were younger, recently you have been going back and forth between Broadway and TV. Did those two things conform to each other as you work on this show? John: Yes. There’s only three places I can do what I do. TV, movies or the stage. I guess I can stand in the corner of the promenade and recite Samuel Beckett characters […] I don’t know how well I would do but all them conform to each other because it’s basically the same job […] It brings discipline in your stamina and in TV you can be balls out 100% of the time because nothing lasts longer than two minutes […] You’re going to stop filming, you’re going to take break and going to start again. Same with movies – although movies are more of a mini marathon, and stage is a marathon because once the curtains go up it’s yours for two and half hours […] And you shouldn’t stop. It’s not a good thing to stop once you start […] I did a lot of stage when I was young. That’s where I sort of learned to act in LA. Once I got successful I had no time for stage, and I’ve been asked by some of the greatest writers on Broadway to do something and I couldn’t […] No producer wants to hire you for three months to do a play, because if it’s successful they don’t want the star leaving the midst of that success. So, I had to avoid until the end of the series I did with James Spader, Boston Legal. I took time off and said I’m going to New York to see if anyone would care if I showed up, and I got offered an off Broadway play which is a perfect entry level for me because I live and work in New York. First time I came to New York was to host Saturday Night Live. Never been here before that as far as working […] I’ve been here to do talk shows to promote my seasons of Night Court, etc. but never been here as an actor […] And the off-Broadway was a great experience, and all of a sudden How to Succeed in Business Without Really Trying comes across my desk and I say ‘Wait a minute, I get to work with who for a year?’. I jumped at the chance; my first Broadway play I get to do with Daniel Radcliffe for a year every night on stage. It was just spectacular experience and the good graces of God I won my Tony for my first Broadway play. It kind of spoils you that way you go from there […] I got to be on stage for eight months with James Earl Jones and Angela Lansbury […] It’s been like a cornucopia of blessings and I want to repeat that, the experience, at some point when I get the time. Q: So, is he going to toughen up again after what happened in the finale or are we going to see him continuously soften up? John: He becomes more redeemable to them, and I think his affection for them becomes more evident as the season goes on. He has a particular, I think, soft spot for all of them individually and as a group; their hearts are in the right place […] He considers them neo-phytes but not amateurs anymore. He cares for them. We see him go out of his way to try and help them, save them, when he can. So, he loves them now. He can’t love anybody too much. I just watched, not a great movie, but The Age of Adaline […] How this person stopped aging at 29 and it’s 80 years later. So, somebody like Jenkins, and that’s a crack to the actor rights to themselves, isn’t shared very often, Jenkins has never, maybe for eight or nine hundred years has not had a real relationship, a fully informed relationship because they are going to die and he’s not. It’s like owning a dog, you know the dog is going to die before you so it’s difficult to give yourself completely and utterly, shamelessly and selflessly to a relationship like that because you know it’s temporary. So, his affection is guarded because of that. That’s again the actor story I tell myself. Q: What do you think the fans are going to love the most about season two? John: I guess, the effects are better, the stories are bigger and broader and more, there’s much more at stake and the things that people tune in to watch this show for, I believe will just be there in spades […] And the idea that everyone can sit down and watch it […] It’s family friendly. Q: Considering your rich history in TV for years, how does playing this character differ from the ones in the other shows? John: Well, every character is unique even if it’s in front of some cameras and there’s a guy telling you start and stop acting. I don’t approach anything the same because I’m not very well-trained, as I said before, so I approach it in the moment. I took Jason Robards’ advice when he said, ‘it’s not on the page it’s not on the stage’. I do have a weird little habit and my wife always goes why? If my character doesn’t know what’s going on in the script I don’t know, I don’t have to know, I don’t read scenes my character isn’t in unless they affect my character […] So, every character is in that world that I’ve created in order to relate to everybody else […] But as far as the working thing is concerned, it’s all the same. You show up, say your lines, as Spencer Tracy said know your lines and don’t bump into the furniture. Q: How’s the convention going? Christian: It’s good man. I always love these things. I just got done with one in Fort Lauderdale last weekend and I go to Tulsa next week […] With conventions like this and other conventions I do, it’s really not about […] Everybody gets to see their “superheroes” on the screen and what they don’t understand is that this is our chance to give people a hug, high five, and say thank you for making us exist. So, it’s really love going both ways and that’s why I love them so much because I get to shake hands and tell everybody thanks. Q: The panels are the best […] The excitement that everybody shares from wherever they come from and you’re just a family, loving a thing together. Christian: Somebody was dressed up as Jacob Stone. She had the axe and everything […] She had the strap with the maps hanging out and the axe. It was pretty cool. It’s such an honor to come to these things and see your character. Q: Was it here or another? Christian: That was here. I just saw her on the panel and then somebody got Jacob Stone, I’m like running with an axe and jumping, they got all that tattooed […] It’s crazy man! Somebody asked me the other day, they said you come these conventions a lot and I’m like that; I’ve always done them […] I’ve done it for 15 years and I never realized I’ve played three characters, lot of people play one character and are allowed to come here, I’ve played three characters that fit into this genre. When I was Lindsey on Angel, when I was Eliot on Leverage, which wasn’t really a, this type of show, but they accepted us anyway […] I’m very fortunate. This is the world I live in and not a lot of people can get to experience stuff like this. Everyone I know, who’s an actor, wants to come to these, but they want to be here for a reason. Kind of like the Academy Awards; there’s all these after parties, and they’re like you want to go, and I’m like I’m not going until I’m supposed to be there. It feels the same way with these things and I get to experience all this. Q: Can you tell us a bit about where Jacob is going in season two? Christian: You know, episode 2×03 is right after the two-hour premiere the following week and we go back home and you see everything there is to see about Jacob Stone […] It’s a really big trial and tribulation…it’s walking through Hell and all my cards are laid down on the table, which is fun for me because now you get to see my character transform and to what we saw at the end of the last season where we went, where we were the Librarians for ten years; now it’s like Indiana Jones or Drake from Uncharted and all that stuff. And that’s going to be the end character for me. We all know where we are going and now you get to see him change […] He’s not that little shiny bunny that walked in and go ‘Okay! Magic’ and ‘Oh my God! I can’t believe I’m here’. He’s starting to get that thing where Flynn transforms from the first Librarian to the superhero now. That’s 10 years of him. He’s seen everything, he’s fought everything. You’re starting to see that come along with all the characters, especially Jake. It’s fun to start walking this way. Q: What’s your favorite moment from the first season? Christian: I really love the last episode where I got to…where I was the Librarian for 10 years because it showed where my character was going. I liked the Fairytale episode; we had all left, Noah left, it was just us now, the team, and Jonathan Frakes came into to direct…we all know and love very well and it was so much fun because now we are getting to add comedy. Noah wasn’t at the helm anymore, we were taking the reins. And it was so much to be able to play off the other actors […] Because we were thrown in so fast, that’s when we started learning about each other and become a family, not on the show, but as actors. So, that’s one of my favorite episodes. The whole thing. Where I’m looking down and the owl shows up, that’s my favorite day. I got to literally hold an owl. It was pretty cool. Q: You talked about your seeing, like 10 years from now you can see where your character is going to be, where would you prefer personally for your character to go? Christian: I’ll tell you, man, I’m really happy with what we saw because you know I’m an action junkie. I love that. I’ve done that for so long so to see him have precision in fighting again, sort of like Eliot, and not be stupid about stuff. He’s figuring stuff out. The one thing I wanted to do was I was supposed to do this talk and stuff, and I said no I want to run around these trees like Noah Wyle would, because that’s what Noah would do this thing; he would know exactly what he’s talking about. I kind of took a lot from Noah’s character as well. I think if my character got to exactly that guy I would be very happy. I created the whole outfit. There was a picture online of Drake from Uncharted and me, I was wearing the same thing. I actually copied it to a T. I don’t know if I’m going to get into trouble by Naughty Dog but it was fun. That’s where I want to be. We all kind of know the end games for ourselves by talking to John Rogers. John Rogers knows exactly how this show is going to end […] I think at the end of this Lindy is going to be very magical, John Kim is going to be an unbelievable spy, and I’m going to be Indiana Jones. That’s just how it is. Having someone like Harrison Ford to look up to as Indiana Jones is not a bad place to shoot. Q: Have you missed the physicality though going from Eliot to…? Christian: I do. I miss it a lot to be honest with you […] Of course I got split open in the hospital twice a year […] It was bone on bone and all that stuff and what people don’t realize was that if you love dancing, it’s basically a dance. We’re not hitting people in the face. You got to move with the other person and I miss the dance. You know, I miss it a lot. But I fight a lot this year. So, I have to think, God willing if we get picked up season three he’ll be fighting even more, probably three times as much this year than last year, and hopefully that’ll be a trend and hopefully that’s where my character is going, which is where I want to be. Christian: Thank you very much. I hope you got everything. Q: So, where did the doorway go at the end of last season? Rebecca: That’s a good question. I’m not sure, but we pick up coming back through the doorway from the Amazon. Even Flynn has been off adventuring this whole time. I’m not sure where that door […] Coming back in from the Amazon and there’s a little bit of tension because Flynn’s not completely accepting of the Librarians in training as full on Librarians. He wants to keep off adventuring and Eve misses her new family, and she’s a little bit worried about them even though she shouldn’t be because she knows they are capable, Librarians, and they can handle themselves but she misses them. Noah’s only in five of our ten episodes and there’s a little bit of disconnect between them. They are like ships in the night romantically this season. When he’s feeling affection for her she doesn’t notice, when she’s feeling affection for him he’s not noticing it. There’s all these near misses for us, and of course with any series and relationships we want to string things out as long as we possibly can. So, we’ll see where it goes. Q: Will we get to see the Libs protect Eve? 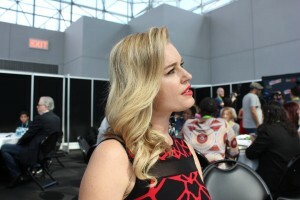 Rebecca: I feel like there was something in the first season where I think we saw that a little bit. I can’t put my finger on what it was. Q: It was when she disappeared. Rebecca: When she disappeared, also at the end of the Haunted House episode, she’s the one who ends up getting beat up the most and she’s got to lean on them literally. So, no character is interesting unless you see their vulnerabilities. Eve can’t just be hard as nails, tough robot lady all the time. Yes, she needs them as much as they need her. Rebecca: I think it’s the idea of these fictionals coming to life and how far that can go. It’s literally limitless and people keep asking me what type of universe you want to visit in Librarians? What haven’t we seen yet that you would really like to see? And it’s like, you don’t know what you don’t know. Our world is limitless because magic. And so, when we get these scripts we can’t believe what our writing staff comes up with. John Rogers has this wild imagination and he takes us in these directions…we have a time loop episode that I’m crazy about. We also have another alternate universe episode which are always my favorite because it turns all of our characters upside down, and last season our alternate universe episode, Eve Baird was the only one who was not in the alternate…who wasn’t playing an alternate version of her character. This season it’s Noah’s and we’re all stuck in this alternate universe, playing these other versions of our characters and it is just so fun. Q: You got two good shows on the same time. How is it to juggle a competitive reality show with a scripted giant series? Rebecca: My children miss me. I feel like a bad mother this year; it’s certainly a high class problem. I love it because I had so much fun on The Librarians, which is so different from doing Skin Wars. On Skin Wars I sort of get to let my supermodel freak flag fly and on The Librarians it’s the opposite. It’s like I have to sometimes check my vanity at the door and spend five minutes on hair and makeup and I’m out the door in my suit. So, it’s two very different things and I love them both. I get to work with RuPaul in the other one and it’s fantastic. It’s a real good time. I just came in, we shot until four in the morning the night before last, and I took a six-hour flight to come straight to a talk show yesterday. It’s long hours. But again I’m not complaining. Q: What type of character development you would like to see happen? Rebecca: I guess I would like to see, we would all like to see a little more backstory. I would love to meet Eve’s family and get to know what happened. I know she grew up on army bases; she was an army brat growing up. But I would love to see a little more backstory of her family. We see one of her ex-boyfriends this season, but we still don’t know much about her backstory. Q: What was the most challenging part of shooting season two? Rebecca: It’s usually something logistical like shooting winter episodes in summer time, all bundled up. When we shot our Christmas episode last season it was a 100 degrees every day […] We are all bundled up in scarves and coats. And our locations are gorgeous, but they’re hard to get to sometimes. So, they’re really like logistical things that are challenging. Other than that our writers room is in LA and we shoot in Portland, and there are a lot of things that happen on the page that just don’t work out on a practical level, so there’s a lot of messaging that happens on our end when we get the script, when we are on location and realize that this doesn’t work here on a practical level. We got to message this and fix this. So, there’s a lot of that, which is kind of fun for us because it’s almost like being a field producer. Q: Do you get to do a little improv? Rebecca: Oh, a lot. All of us. We are constantly tweaking and making it work where we are. It’s good. Q: It is good. It shows on the screen. Rebecca: That’s the thing. We have so much fun together, and people keep asking me who’s the prankster on set? And it’s like we don’t have time for that. We shoot seven day episodes. We are on set all the time working, and our fun goes into the actual work itself and improvising and catching people off guard. We love to catch people off guard and see how people will react to different things. 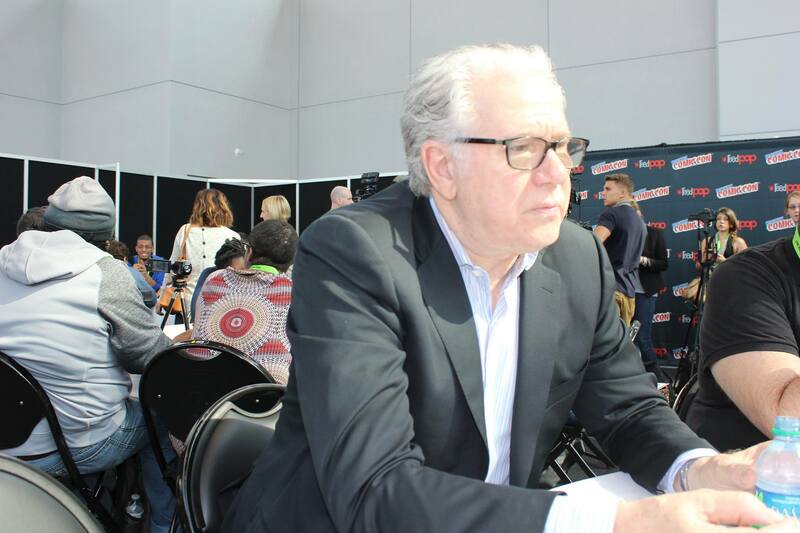 Of course John Larroquette is the king of the one liners and he can elicit a different reaction from us all the time […] It’s a good time. And I think people like to see that, the audience wants to see people having a good time. If the cast is having a good time the audience will have a good time. .
Q: On a personal level how satisfying is playing a strong female lead? Rebecca: Very, especially having daughters. It has sort of become kind of a criterion about how I pick my projects these days, because I spend so much time away from my daughters. 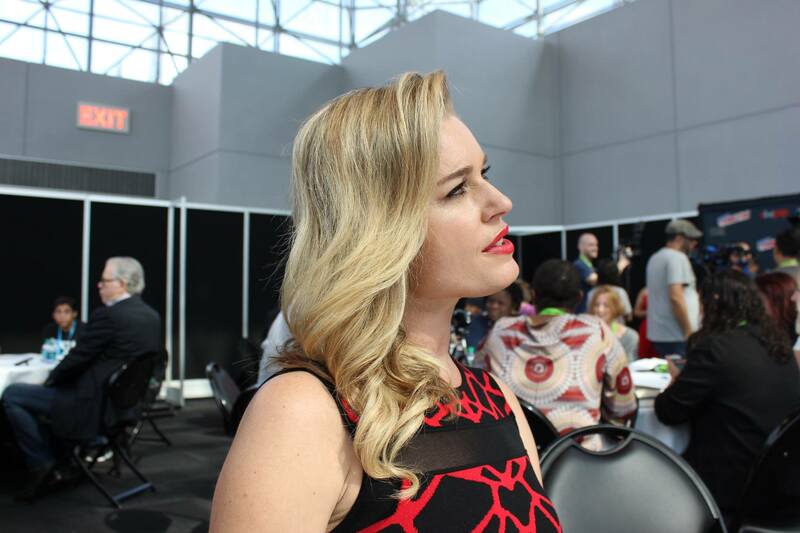 I want to work on projects that they will actually be able to see and they love The Librarians and they love Skin Wars, too. They are both painters, so I feel that even if I’m away from them for this x amount of time, they can see what it is that’s taking me away from them, and we can all enjoy it together. It’s such a great time on television as far as female characters go, and I’m so lucky to get to play a very strong female character among others. I consider Mystique one of them as well. As a mother of girls, it’s important to me.